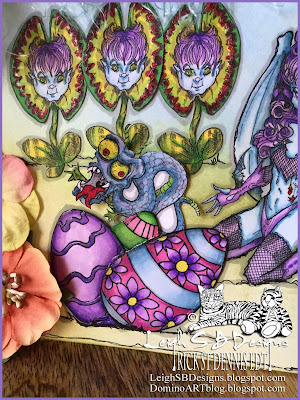 Velvet Paw Creations: Monster Egg Hunt - Easter Contest Rick St Dennis FB Group! 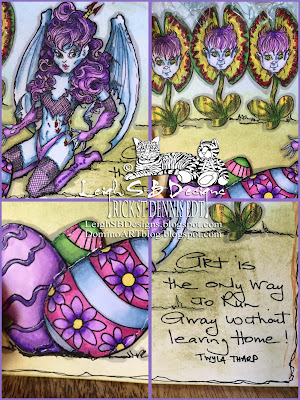 Monster Egg Hunt - Easter Contest Rick St Dennis FB Group! We're currently hosting an Easter Contest over at the Rick St Dennis Digi Fans and Friends Facebook group. Nightflyer the Succubus was hexited to find her Easter Eggs! She was even more eggstatic with her surprise critter...I made the monster version of Kinder Eggs with a surprise inside ;0) The Easter Eggs form a pocket and the little critter tucks inside. All digi images are by Rick St Dennis except the Easter Eggs which I drew myself. the Venus Flytrap you'll have to ask Rick about! All the images were printed out onto Neenah solar white cardstock and coloured with Copics. 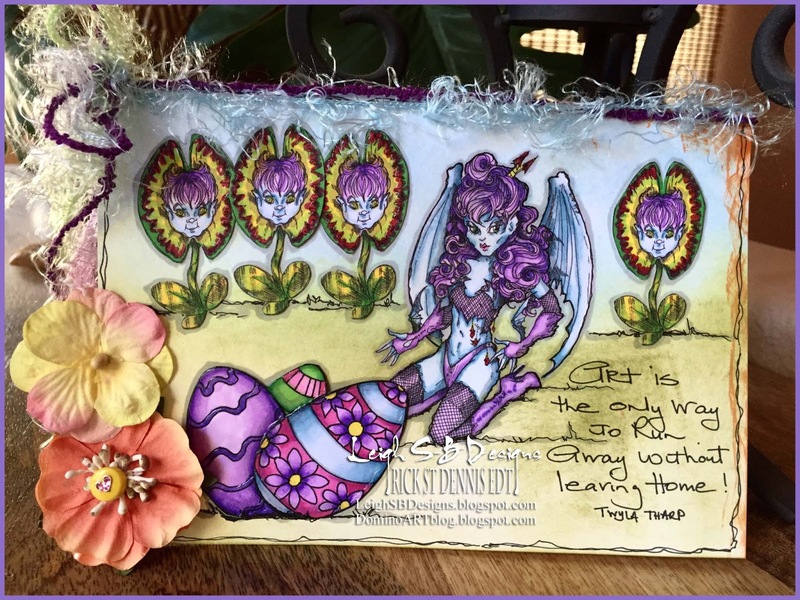 For a touch of magical sparkle and dimension I embellished the flowers, eggs and the critter with a Viva Pearl Magic Transparent White pen which is a dimensional gel with a pearlescent shimmer. The succubus was printed on her own so I could make the folded card and she was then masked with liquid mask so I could add the background. I just played and randomly applied Peeled Paint and Tumbled Glass Distress Ink with a foam applicator and a touch of Memento Tangelo applied directly. I hand drew the Easter Eggs, added "landscaping", handwrote the quote and drew the lines around the card with a black Copic fine liner. The flowers, eggs and critter were all fussy cut out and adhered with Scotch Quick Dry adhesive. I finished my card with the fancy fibers and two paper flowers, one of them was attached with a yellow brad and embellished with a little pink jewel heart.